We are the leading manufacturer and supplier of Pallet Collars to our valuable clients. In the world of Pallet Collar, we are a leading name emerged as a winner in the market supplied with hinges on the corners, so they can fold flat when not in use, our pallet collars are also heat treated to meet sanitary regulations, making them an ideal choice for usage. These have a number of applications in the packaging and storage industry and are made available at extremely reasonable rates. 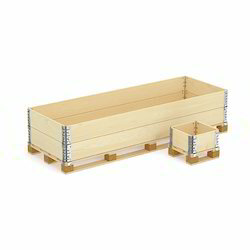 These strong and durable Wooden Pallet Collar and lids fit on standard pallets and are a great way of storing and dispatching goods. It is possible to build them to just the height as per the need. They also reduce the risk of manual handling injuries, by allowing the sides of the container to be adjusted gradually as products are placed inside, thus eliminating the need to bend over high bin sides.